Today I went to Great Clips to get a much needed haircut. I figured since I am spending the whole summer working a summer camp less hair would be a plus. As I went in I did the normal routine. Check-in, sit down with strangers and feel awkward, see an old friends from high school I have not seen in year, and finally get my name called to get my hair cut, well shaved! When I sat down the lady, somewhere in her upper 20’s or lowers 30’s, asked me where I went to school. I told her I am currently attending Piedmont Baptist College and she said, “O a pastor!” Even though I am training to be a youth pastor I figured it was close enough so just went on with the conversation. After I told her why I don’t want hair and wouldn’t mind having none she said, “well you men can do that, but the Bible says women cannot cut their hair.” I smiled and laughed slightly and she asked why I was laughing. I simply said, “you can do that, but hope yall cut your hair eventually.” She said, “but the Bible says we can’t.” I went on to explain to her that was stated in the Old Testament and there are Laws in the Old Testament that are not enforced today due to Christ coming to die on the cross and fulfilled/ended the Law. I told her the Old Testament is full of Laws and now in the New Testament we have Christ and when accept His free gift of salvation (The Gospel-1 Corinthians 15:3b-14) and it’s more about a relationship than just following the Law. I thought that was end of the conversation and honestly though she was a unbeliever. After a few awkward moments the lady asked me why do I feel like God wants me in ministry. I went on to tell her how growing up in High School my father left so my youth pastor (Jeremy Pollard-now is a children’s pastor at The Summit in Durham, NC) was sort of my father figure and took me under his wing. He lead me to Christ, gave my ministry opportunities, and built a relationship with me that still last today. Thanks to him I got to work in the youth group as a college leader and eventually was an intern over the youth group. I explained to her how through that God called me into ministry and my heart is in youth ministry. She said she loved how I said “called” and went on to explain that she has had times when “called” her to stuff and people just don’t understand. She said that people like us who are saved know God’s voice and know when He speaks to us. Wow, I thought, thats so right! By that time, I knew from her profession that she must be saved. At about this point I felt God move and the Holy Spirt say this is an opportunity to encourage and to receive encouragement. 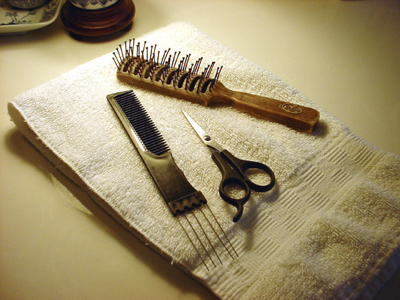 If this was all that happened, it would have been more than enough because God encouraged me and showed His goodness just in this short conversation, but God added one more thing before my haircut was done. I asked the lady where does she go to church. She told me about the church in the area she is a member of and how much she liked it. She said before she went there she heard negative things about the pastor. She said she wanted to check it out for herself inspite of what people said which to that I though was respectable. She said after a few months of being there her son and mother passed away in a few months apart from each other. My heart sank as I thought about the pain she must have experienced. She told me how when her mom died she or her mom before she died had enough money to have a proper burial. The pastor (so called “bad” and had negative comments thrown at him) gave her money and paid for a proper burial out of his own pocket. She explained how that encouraged her and helped her so much. I told her “actions speak louder than words” and we both agreed and I could see how that experience of that pastor helping her was an encouragement still to this day. She asked me where did I go to church and told her where I attend. I told her something I was dealing with in the area of church and she told me something that I needed to hear. God knew I needed to hear this and I believe through her, God spoke directly to me and told me what I need to do. She said, “well just pray and God will tell you what you need to do and direct you.” Simple, direct advice I have heard many times before, but today is right when I needed it. God knew it and He choose to use this sweet lady as a vessel He could speak to me! That last paragraph is the whole point of this post. God knows when we need an encouraging conversation or a word from Him. he knows exactly when and how we need it. He will act at the right time. As I left the place and was driving home God reminded me of a point that Bruce Chick (pastor at Sovereign Grace Community Church in Roanoke, VA) said a few Sunday ago when I was there. He said, “we need other people[Christians] because God lives in each of us who are saved [literally lives in us], and so we can directly speak the words of God to someone and they can directly speak God’s words to us.” Wow, thats good stuff! Don’t say we don’t need other Christians because we do! They have Christ IN them like we all do who are believers! So we need each other because we have Christ in us and we need the help and need to be helping! Overall, God encouraged me so much through this event this afternoon. I hope I never forget that God will always give me little instances like this as I go through the journey of my Christian life. I believe God is concerned about every little detail of our lives and will use even the littlest, most random things (like hair cut places) to speak to us! Keep your eyes and ear open for Him and don’t be afraid to speak the words of God to others when you have the chance! Next Post Four Lanes of the Emerging Church: Which One Are You In? Austin-i greatly enjoyed reading this post and couldn’t help but smile with joy for God is ever speaking and moving in the daily scheme of things. If only we we would be more sensitive and open to the opportunities where He wants to use us or someone else to further the kingdom. Yes we DO need each other. Your encoragement was encouraging to me and I felt Gods sweetness reaffirming the importance of building one another up.